Crazy Heart is the story of how The Dude became a country singer. 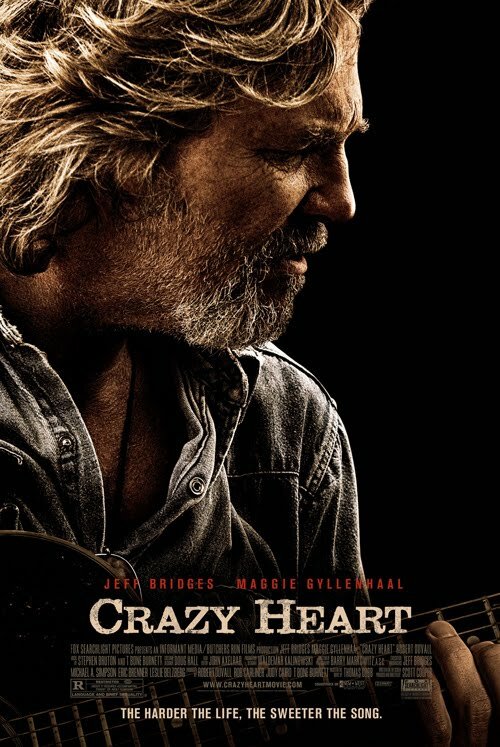 Crazy Heart follows Jeff “The Dude” Bridges as country singer Bad Blake in the twilight of his career. No longer selling out shows, he’s lucky to play small town bars and bowling alleys. To add insult to injury, the spectre of his former protégé selling out shows major shows across America looms over him. Then, a when he agrees to be interviewed as a favor to a local piano player, the interviewer (Maggie Gyllenhaal) sets Bad Blake on a path to getting his life back on track. But make no mistake; this is no feel-good weepy. Bad Blake has done some hard living, and some mistakes can’t be repaired in the runtime of a movie. This film is a showcase of excellent acting and benefits from having a sold screenplay. The film could absolutely been a cheese-fest in the wrong hands. Fortunately for moviegoers, this film is a masterful character study of Bad Blake and the lengths he went to be a professional musician. First-time director Scott Cooper, who also works on the screenplay, synthesizes everything on screen to near perfection. The Dude absolutely embodies Bad Blake, and the acting is so good by the supporting cast we could almost be watching a documentary. Story points include such topics as alcoholism, regret, failed marriages, and music business woes – again, all potentially the ingredients for an over the top melodrama, but Crazy Heart is done with a delicate hand, great actors, and an insight into the human condition. Supporting actors include Gyllenhaal, Robert Duvall and a surprise, superstar cameo as Bad Blake's protégé. This movie is recommended for anyone who wants to see a good drama, and/or has Music in their veins – even if that music isn’t country. Some of the performance pieces might be more or less enjoyable based on how much you like the music, but the role the music plays in Bad Blake’s life would not have come though if the performances were glossed over – so don’t let that stop you from seeing a fantastic film. The Dude abides. For this film, so do I.